Our dog population is generally pretty stable. Up until last fall we hadn't had any additions or subtractions for about 4 years. Then last September we decided that we needed to put down Tibby, our 14 1/2 year old Lab/Dalmation. She had gotten to the point that she wasn't able to get up on her own a lot of the time. In November our Australian Shepherd Banjo got hit and killed right in front of the house. Whoever hit him left him laying in the middle of the road. He was the best dog we ever had, great with kids and guests, and just starting to hit his stride with herding livestock. That left us with only one dog, Sheila. 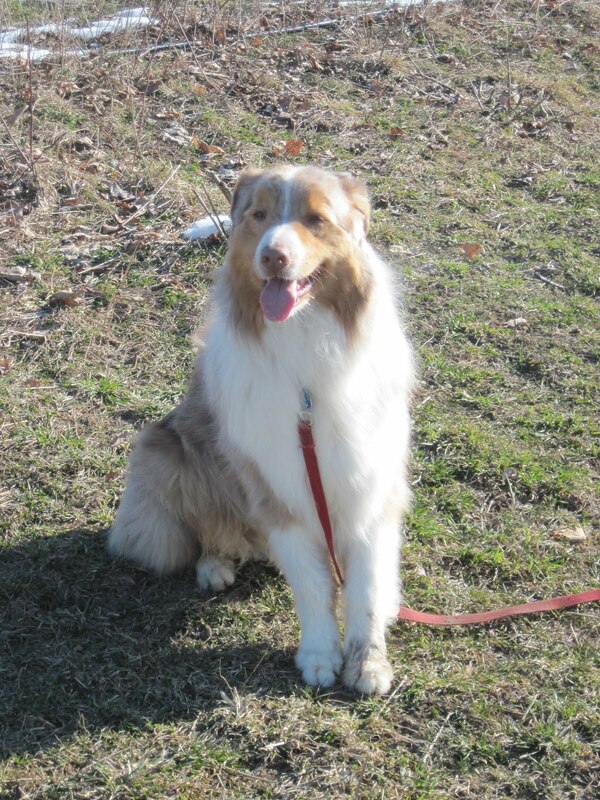 She is a good dog too, but has no real herding instincts, so we decided we should try to find another Aussie pup. After seeing an add in one of the local farming papers, we went down to look at a litter of "Aussie" pups, and ended up picking out this one, who we named Piper. The next day we realized that it didn't matter what we called her, because she was completely deaf. We decided that it was too dangerous (for her) to have a dog that couldn't hear livestock or machinery coming up behind her, so we returned her and brought home one of her litter mates. She ended up with an older couple with a fenced in yard. Finn, who is a brother to Piper is kind of a strange little dog. He was supposed to be a pure bred Australian Shepherd, but he never quite looked the part, so we decided it might be fun to have him DNA tested. 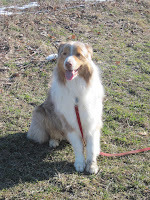 His father appears to be all Aussie, but the mother's side seemed to be so mixed up that the only thing the test could isolate was that one of her grandparents might have been a Sheltie. Then the other day Sap House Bill pointed out an article in a magazine that had a breed of dog called a McNab Sheepdog. These McNabs look an awful lot like Finn, and even more so like his mother. Finn is a pretty aloof dog, preferring the company of Sheila over people. He does have pretty good herding instincts (a bit of a Napoleon Complex though), but he may not be willing to leave Sheila long enough to use them. I think we'll be able to work with him though. At this point, I am sure that some people would argue that 2 dogs is probably enough, but when someone let me know that there was an Australian Shepherd up at the pound I figured I'd better go have a look. Rosie seemed like she would be a good third dog until she lunged at a couple of the kids without provocation. She was probably a salvageable dog, but we weren't willing to risk someone getting bit, so ended up returning her to the pound. I watched their website for a few weeks after and she went out and was returned a couple of times after that, so I guess we weren't the only ones that thought she wasn't trustworthy. Then, last Sunday we went down to see Mel, an Aussie who had been returned to his breeder because of a divorce. It looks like he is going to work out to be a good fit. As far as we can tell he's pretty much bombproof around kids, and anyone else for that matter. He is a bit of a counter surfer, but we are hoping to be able to break him of that. He has some interest in livestock but I haven't had a good chance to see what he is going to do. So, barring any bad luck, this looks like it should be the lineup for awhile. Congratulations..I see great potential with that crew..for high jinks, at least. It can be a real challenge to put just the right gang together. Sorry for the losses, and congratulations on a new generation of farm dogs. I really enjoyed reading this today, and I agree Banjo was an extraordinary dog. Looking forward to meeting Melvin!